State officials in Texas don’t run on tickets of their own choosing. What looks to the voters like a team — with candidates for governor, lieutenant governor, attorney general and so on — is really just a collection of unrelated candidates who happen to belong to the same political party. They don’t have to get along any more than the dachshunds in a wiener dog race. Candidates picking the pockets of rich partisans and seeking the support of Texas voters work solo, not in packs. In other states, governors and lieutenant governors get elected together, like presidents and vice presidents. Many states have cabinet governments where, as in the federal government, the chief executive chooses the state’s top lawyers, finance officials and other high officials. The governor runs the government, gets the credit and takes the blame. Texas governors get some of the credit, most of the blame and none of that power: The 18 judges who sit on the state’s highest civil and criminal courts and the eight officials who run other executive departments are elected in their own right — sometimes from opposing political parties or factions. Photo ops are the only Kumbayah moments. Abbott can’t control the comptroller, steer oil and gas regulators, decide whether and how the state jumps into lawsuits, or run the Senate, the agriculture or land offices. He didn’t hire them. He can’t fire them. And replacing them is left to the voters. 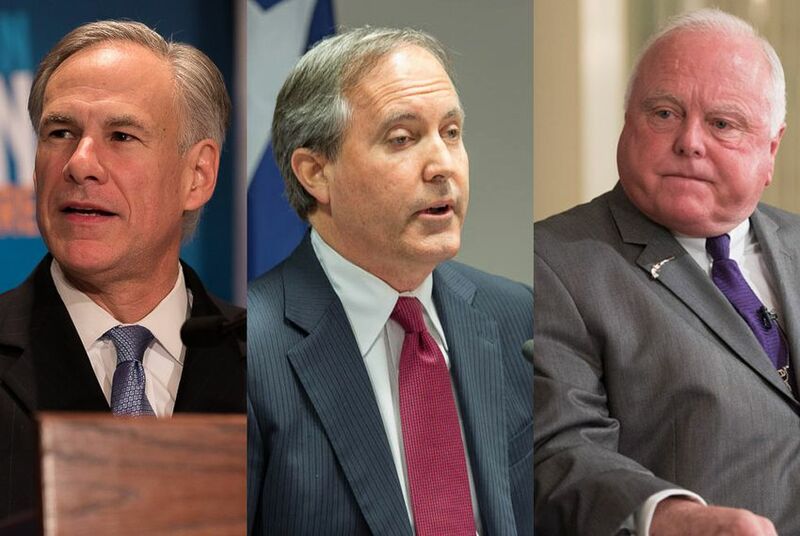 But if the wheels of justice turn against Paxton or Miller or both, forcing or prompting one or both of them to leave office, the governor would have vacancies to fill — just as he would in a cabinet form of government. The new occupants wouldn’t be under his control, but they would probably remember how they got those great jobs. It’s a subtle difference, but a real one: Are they going to check in with the governor’s office on big decisions and announcements or follow their own political stars? The jockeying and conversation about the attorney general’s post has been active for months. It dates back to last summer, when Paxton’s legal troubles escalated from campaign issues and a relatively small fine for failing to register as a securities agent to official charges of first- and third-degree felonies. Now the U.S. Securities and Exchange Commission has added civil fraud charges in federal court, and the talk of who might succeed Paxton has picked up again. Since the longest-serving AG in state history is the governor himself, an appointment to that office might be of particular interest. A couple of Texas Supreme Court justices have been mentioned — Eva Guzman and Don Willett. Star attorneys from his own circles might be on Abbott’s list, as might Dan Branch and Barry Smitherman, the former Republican state officials who gave up their posts to run unsuccessfully for the job in 2014. Talk of a successor for Miller is even more muted. The head of the Texas Department of Agriculture is a less important office than AG, for one thing, and silence is the best sign that the agency is running like it is supposed to run. It makes news once in a while, but that was the exception until Miller took over. Now, after a couple of out-of-state trips that were initially billed to the state and later determined to be more personal in nature, Miller is under investigation by the Texas Rangers. The governor, through a spokesman, said last week that the investigation is warranted. An assistant could take over for Miller if the need arose and if the governor said so. An outsider could be named; Miller was one of four Republicans who sought the office in 2014, and one or more of his opponents might be interested. Either appointment would be rare. Two in one governor’s tenure would be unheard of. But Abbott, unlike most Texas governors, might get a whiff of what it’s like when the state’s chief executive actually has control over the executive branch of government.